The president’s positions on border security are well known … [the migration numbers are] crazy. The question is ‘Can we deal with that and not have economic damage?’ I think the answer is that we can, and people are looking at different options, particularly if you can keep those freight lanes, those trucks lanes, open. That is probably the nub of it. But business also wants continued access to workers who commute from Mexico and to tourists arriving from Mexico. “That may be difficult,” Kudlow said. White House officials say trade disruptions will happen as border officers are transferred from border checkpoints to help chase and registered the rising flow of economic migrants from Central America. Allowing trade disruptions “is not our first choice,” she said. We’re going to close large sections of the border, maybe not all of it. But it’s the only way we’re getting a response, and I’m totally ready to do it. The threatened closures are mostly intended to pressure Mexico’s government to shut down the transfer of Central Americans through Mexico. That flow is expected to have hit 100,000 in March and may exceed one million before October. The flow is rising because the migrants and the cartels recognize that Congress and the courts have cut open numerous loopholes in the border law, so allowing migrants to be released to take blue-collar jobs by simply asking for amnesty. The flow may go far higher than the new record inflow of 4,100 people per day. In November, Gallup warned that five million people in Central America would like to move into the United States. GOP and Democratic leaders blocked border and immigraiton reforms throughout 2018 that would have reduced the cross-border flow. Democratic leaders argue the migration is not caused by the poor migrants’ search for U.S. jobs. They say it is instead a “humanitarian crisis” caused by civil breakdowns in Central America and it should be solved by more financial aid to Guatemala, Honduras, and El Salvador, not by immigraiton reforms and border security upgrades. GOP leaders, in contrast, are pushing for legal changes that would allow companies to import more temporary workers who would go home every year instead of settling and eventually backing Democratic candidates. The accelerating flow of migrants contradicts Trump’s campaign promises and will help suppress Americans’ wages in 2019 and 2020. The flood of cheap labor would block or even reverse gains made in 2018 when blue-collar wages rose by four percent as Trump’s “Hire America” policy lowered the inflow of foreign workers. Any reduction in blue-collar wage gains will help deliver cheap labor to investors and Wall Street, as well as to employers and wealthy professionals. The search for trade fixes is being forced by united opposition to trade disruptions by business and Republican and Democratic leaders. “Closing down the border would have a potentially catastrophic economic impact on our country, and I would hope that we would not be doing that sort of thing,” Majority Leader Mitch McConnell said Tuesday. The top imports from Mexico are automobiles, electrical machinery, medical instruments, and mineral fuels, among other thing. 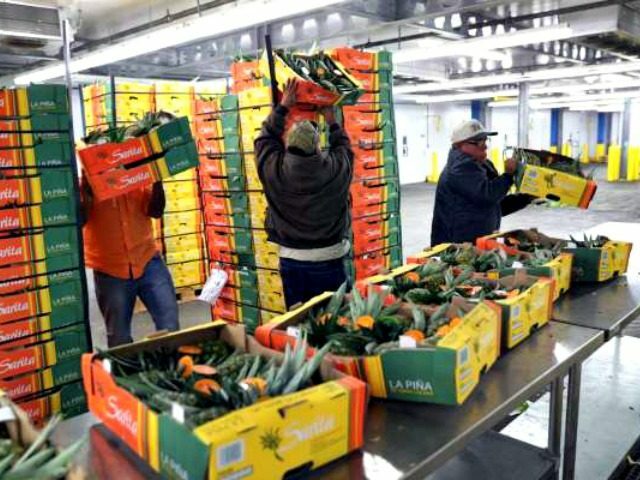 The U.S. also imports more agricultural goods from Mexico compared with any other country, with $11.5 billion in fresh fruit and vegetables brought into the U.S. each year.